Halloween signals the unofficial start of the holiday season. Soon, pumpkin spice will turn into peppermint and the chill in the air will get a little sharper. Don’t miss your chance to have a little fun with your decorating before you shift to holiday entertaining mode! Before you start buying new props, take an inventory of the things you already have that can be turned temporarily spooky. If you have lantern lights, switch to bulbs with a flickering effect or orange hue to mimic candle flames. Then, drape some cotton “spider webs” over the top and finish with a rubber spider. Black lace can lend a creepy feel when placed over mirrors or light fixtures. You can also get colored string lights and weave them through more spider web to cast an eerie glow. Have unused candles around the house? Light a red tapered candlestick and let the wax drip onto white candles, creating a scary fake-blood drip effect. Try something new with your pumpkins this year – rather than carving a goofy face, paint the entire intact pumpkin with paint! You can get creative and paint designs onto it, or paint it black and use it as a chalkboard. 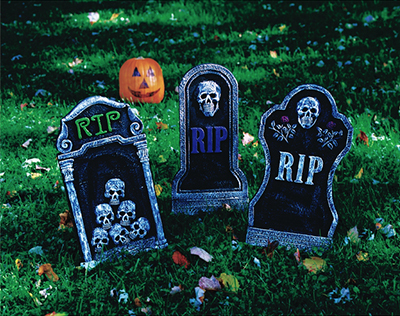 Have any Halloween props or crafts you swear by? Share them on our Facebook page!